I’ve been tempted by others and then cringed as the graphite scratched across the surface of my paper. No. No. No. 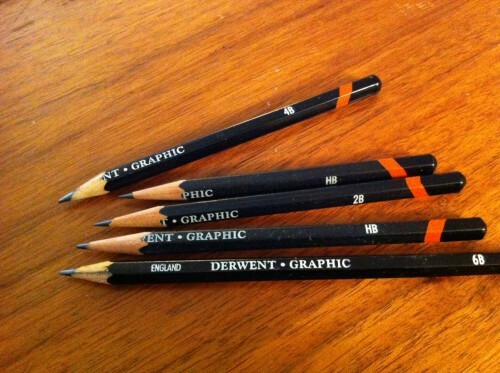 Derwent pencils are perfect. I know exactly how much pressure to apply to make them glide and become one with the paper. They are my zen. Seriously. 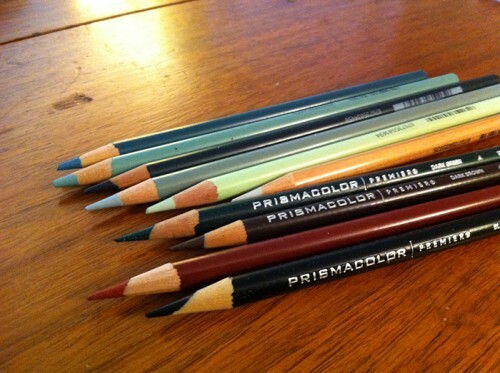 My love of Prismacolor Colored Pencils was the result of supply and demand. I required specific colors and their pencils were the only one in my art supply shop that could be purchased individually. And what a range of colors they supply! I’m also particular about the brushes I use, the paper, and my brands of paint (Holbein Watercolors and Golden Acrylics). Often times I’ve stumbled into using a new tool and then I become hooked. Once upon a time I used Staedtler pens for drawing in ink. 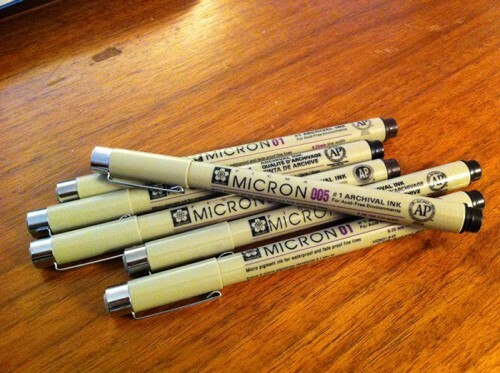 They come in a range of sizes–good pens. Then I discovered Sakura Micron pens and the heavens opened up with tears of joy. I can’t fathom using any other pen for drawing now. They are available in black and sepia. Sepia! If I’m going on a trip and I want to bring something to sketch with, I usually grab these pens and lightweight pad of Strathmore drawing paper. So what are your favorites? I’m positive I’m not alone when it comes to special favorites in the studio. I imagine even writers are particular about their setup and musicians too. Leave a comment, let me know! Tagged art, artist, creativity, Derwent, Prismacolor, Sakura, tools.